YETI Hopper 20, Coming March 1st! We now carry Lucite Paint and Olympic Stain! OPEN from 7:00 a.m. - 5:00 p.m.
We can make your next project a success! 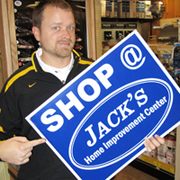 Jack's Home Improvement has been serving the Wiggins, Mississippi, area since 2003. Our goal is to serve our community with personal service, fair prices and exceptional quality. Whether you're a contractor or homeowner you will find that Jack's will make your next project a breeze. Come in today and let our local, family-owned business make your life a bit easier. Hey everyone! We invite you to sign up for our Email Specials to receive the latest deals, coupons, and more from us here at Jack’s in Wiggins. Many of these specials are available to our email subscribers only. To sign up just click the “Sign Up for Our Newsletter” link at the top of the page!